It is stated that Lord Anjaneya, also known as Maruthi (Son of Vayu, the Wind God), who is considered a terror to demons (Rakshasas) is present wherever people sing in praise of Lord Rama, presenting himself with joyous tears in His eyes and folded hands over His head. And to that Anjaneya, We offer our salutation. 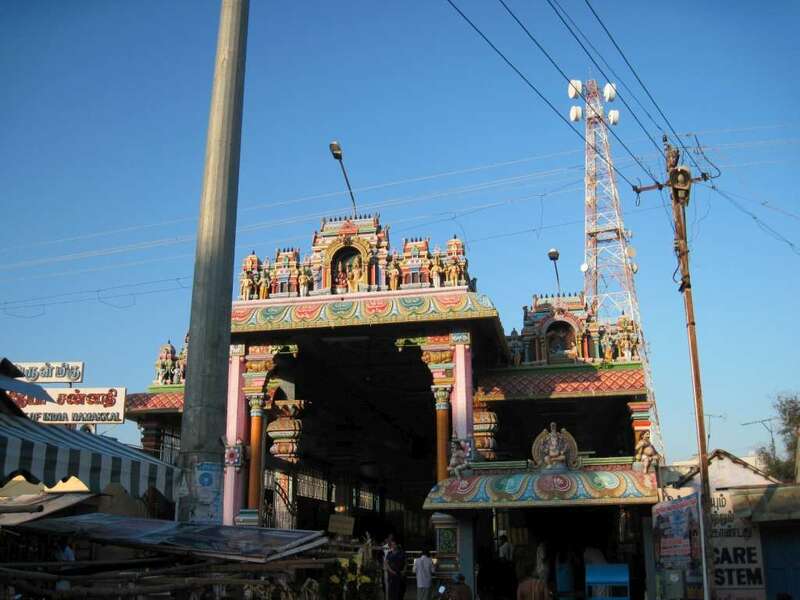 Namakkal – the motor hub, is a place known for body building of vehicles. 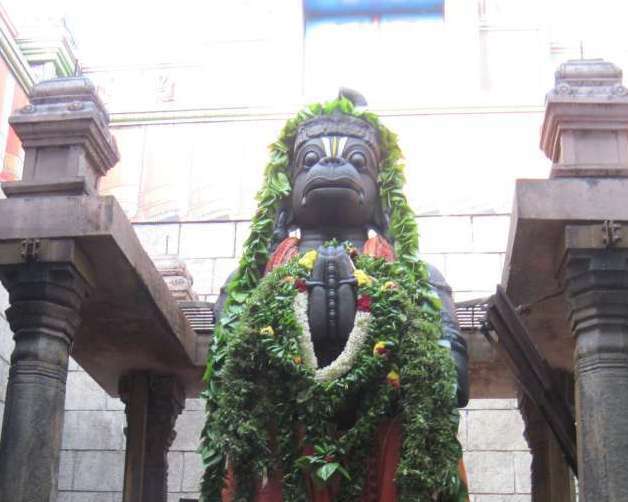 Here is the temple of Lord Anjaneya, the 18 feet tall ‘Viswarupa Anjaneya’ the epitome of virtues – known for his knowledge, steadfast faith on Lord, doing things even before ordained, the most trusted aide of Lord Rama. Hanuman is embodiment of discipline, devotion to His Master and one known for giving boons to all bakthas. The town of Namakkal, has flourishing trade of the body building for all types of trucks. Goods transportation and trucks have become the main stay of economics in these areas. Namakkal is a part of Kongu region of Tamil Nadu which was hotly contested and ruled by the ancient Pallavas, Pandyas, Hoysalas and also ruled over by later day Adhiyamans. The Rock Fort in Namakkal is a special feature of the Town. The Fort covers an area of one and half acres of flat surface and is accessible from South-West by a flight of narrow steps. 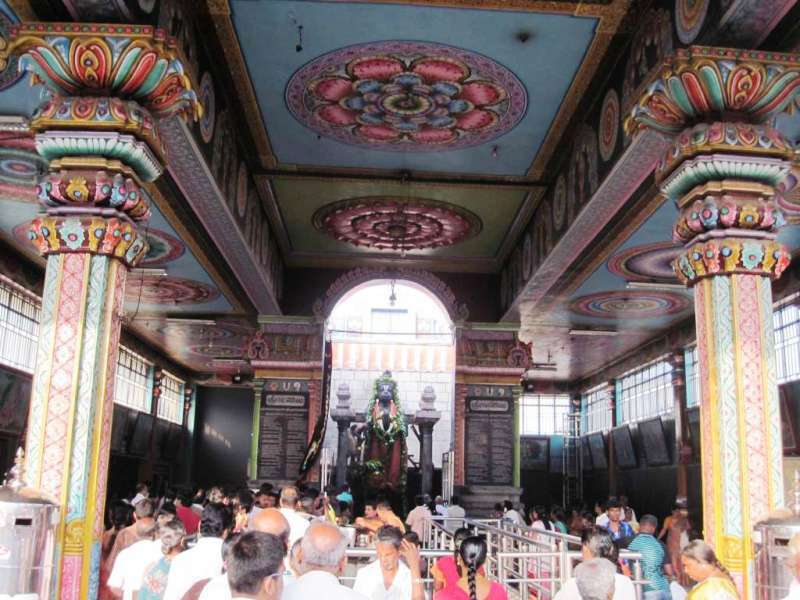 At Namakkal is famous temple of Lord Anjaneya at Namakkal. This is not a divyadesam (not the place sung by any of the Alwars) – still a puranic temple hailed as a ‘abimana sthalam’. 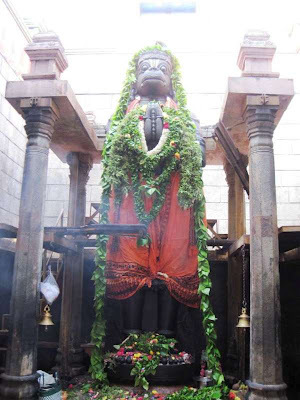 Lord Hanuman in viswaroopam of 18 ft is standing and looking straight in to the feet of Lord Lakshmi Narasimha, situated not far away. 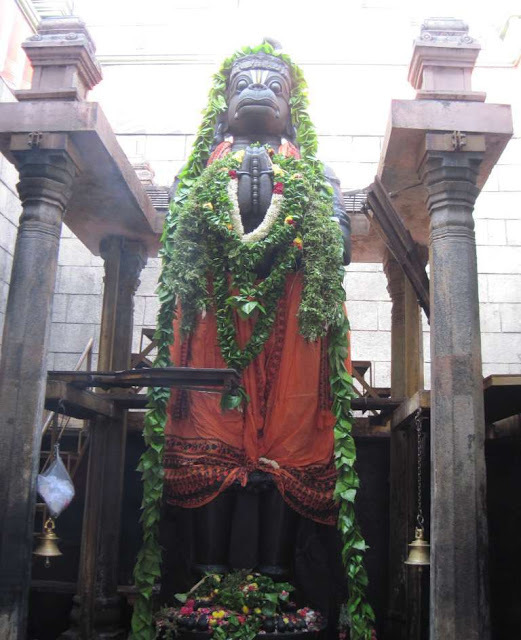 It is believed that this temple is more than 1000 years old and that Lord Anjaneya is guarding the fort of Namakkal. Lord is believed to be ever-growing and hence there is no roof over the idol. Anjaneya, Lord Hanuman is most powerful and yet embodiment of humbleness and dedicated Service to His Lord. He thought of none else than Lord Rama and served His Master. Lord Anjaneya is known as ‘Vayu Puthiran / Anjani Mainthan’ as he was born to the beautiful Apsaras Anjana and Vayu bhagwan. 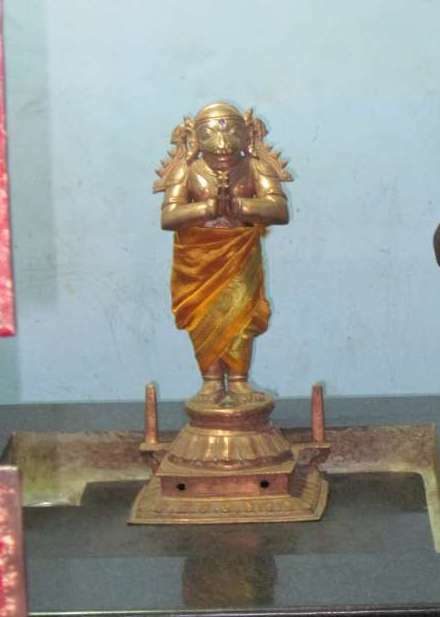 Even as a child, Anjaneya was powerful, and flew towards the Sun in an attempt to consume. Indra, was angered by the sight of Anjaneya flying towards the Sun; he aimed his thunderbolt at the child; Hanuman had his cheek bone broken out of the fall. Read that the Sanskrit word for cheek is hanu. Hence Anjaneya came to be known as Hanuman. Lord Anjaneya is all powerful, yet demonstrated all his prowess in the Name of Lord Rama only. With regards – S. Sampathkumar 10th Feb 2013.